Rated 5 out of 5 by magic2 from Want another one I really loved this game. I loved the story and that is really what is all about. You are following the story with some puzzles thrown along the way. Not to may HOP's which is a nice change. I really did not want it to end and would love to see the story continue. Did not play the CE and found it was fine, the Map helped a lot so did not have to use the hint button very much. I really Recommend this game. Rated 5 out of 5 by leeloox9 from Finally all hidden objects have a purpose Excellent game, very entertaining. 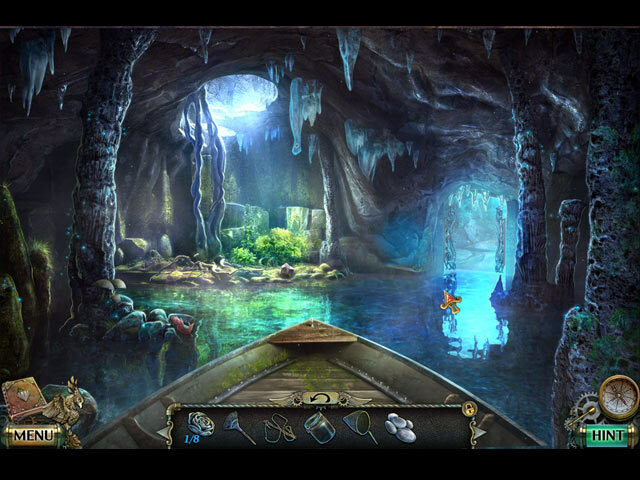 The hidden objects scenes are connected to the storyline so it's not just find random things but you are required to use them. The puzzles weren't very challenging but the story is so compelling I wouldn't stop playing. Rated 5 out of 5 by Chrisppp from More, please! I just finished the CE of this game and I'm here to say Brava/Bravo! It was a great game, good graphics, music was not intrusive, level of difficulty was good. It's been a long time since I've played a game that I wanted to start all over again when I finished. Thanks for this one, Felix! Rated 5 out of 5 by pennmom36 from Just An Ordinary Girl Young Alice was clearing the riverbed of debris underneath the water wheel, just an ordinary chore on an ordinary day, or so she thought. Today will turn out to be the most extraordinary day she has ever known, because today, Alice discovered a box lodged in the sand. When she opened the box, a beautiful bird with wings of flame flew out of the box and into her hand! Not onto her hand, the phoenix flew inside of Alice's arm, leaving no trace except for a glowing tattoo of this magical magnificent avian species. Unbeknownst to her, this bird has a price on it's head and these people will do anything to anyone to take possession of this bird. Alice is now on the run, and her only chance for survival lies within an Uncle she never knew existed until this fateful day! Wow! This is one of those games that could easily slide under the radar, but don't pass this one by, it's solid entertainment with a really fresh storyline. I purchased this game in the Collector's Edition because each scene has a Morphing Object and one Collectible out of several categories starting with hidden eggs as well as fish, skulls and a long list of other interesting objects. Until recently, I thought Achievements were a given in all Collector's Editions, but no worries, this game does indeed have Achievements to earn (in the CE) and a ton of Plus Sign inventory items to tinker with. 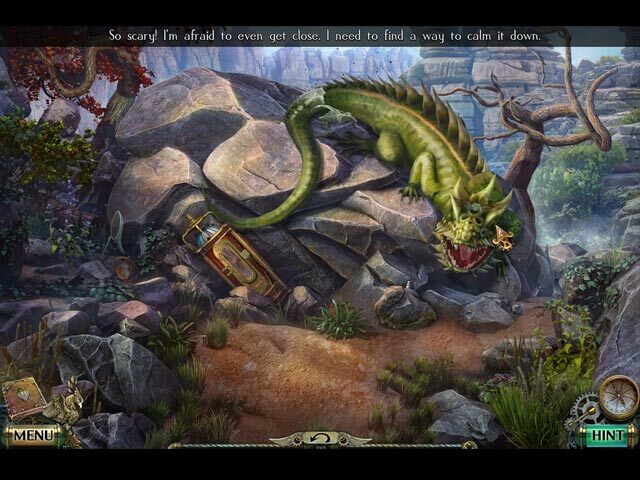 The Hidden Object Scenes are far and few between, but this game has such an incredible storyline and so many thing to do in each scene that you really won't notice or be disappointed about. The HOP's are however, just as entertaining as the game itself, mostly Interactive, Progressive Silhouetted Shape where you find the first item that matches the silhouetted shape and use that item back in the scene interactively to expose the next item. Most of the scenes have at least one puzzle such as placing the moving parts of a deer to mirror the same position as the other deer shown. The Mini Games are plentiful and more than makes up for the lack of HOP's. Below are brief descriptions of some of the mini games you'll encounter during the demo: 1) Pull down all the ropes with knots in a particular order. 2) Select the items on the bottom that are used to obtain the items shown above. 3) Run past the guards without being seen. 4) Select flowers in the order shown on the board. 5) Switch the wolves and rabbits, a predator cannot be placed next to prey. 6) Click on the figurines in the order shown in a clue found earlier. 7) Follow step by step instructions of a recipe. 8) Arrange the mosaic tile pieces to create an image. The Collector's Edition has 10 Wallpapers, 16 Concept Art pictures, 15 Videos, 8 Music Soundtracks, 24 replayable Mini Games, 7 replayable Puzzles, 20 Achievements, 35 Morphing Objects, several categories of Hidden Collectibles, a built in Strategy Guide and a Bonus Adventure, enjoy! Rated 5 out of 5 by biscuitsmama from FIND OUT THE MYSTERY BEHIND THE MARK OF THE FIREBIRD You play the game as Alice, a young girl living an idyllic life with her father. All that changes quickly after you find a chest with a special egg that hatches into a firebird as soon as you touch it leaving you branded with a special mark on your arm. Not long after, your father is killed and you must find your only living relative, your uncle Colin. 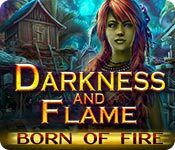 Together you and Colin set out on an adventure that will save you from dark forces. IMHO, the graphics are excellent and include wonderful hand drawn scenes but some of them do seem a bit misty. I am guessing that this was done intentionally but the game’s dev to create a certain feel to the game and storyline. Your tools include an interactive, transporter type map. I happen to love games from this dev who also brought us the wonderful New York Mysteries and Lost Lands series. The game has more puzzles than HOPS however; the HOPs are very puzzle like as well. The HOPS are interactive and items are found by silhouette during the demo. The HOPS are very well-crafted and integrate seamlessly into the gameplay so that one doesn’t get the feeling of stopping to find an item in a HOP and then continue on with the story. The puzzles or mini-games are quite good and even though none are really new I happen to like them and found them excellent. Some of the mini-games are a step up in challenge from those we generally see but none are over-the-top so difficult that they are frustrating. This excellent Tuesday surprise CE game includes a plethora of collectibles that include 6 different sets of items to be collected – eggs, feathers, fish, bees, hour glasses, and skulls. If that isn’t enough, we will also find capsules throughout the game that provide information about the fertile lands. Top it all off with morphing objects and this game is a veritable treasure chest of extras to keep us occupied. The remaining CE contents is fairly standard with achievements, bonus game, strategy guide, wallpapers, concept art, videos, music, bonus puzzles, replay of mini-games and HOPs. I love the storyline and the gameplay so I am giving the game 5 stars even though the graphics have a bit of mistiness. I purchased the CE and enjoyed everything about the game. It took me a almost an entire day to complete because I had to find all of the collectibles and morphing objects. Even though I love this game, please try the demo to see if it is a game you will enjoy. Rated 4 out of 5 by katnap123 from You'll need your running shoes for this one The map is needed because this game is all over the place. Being able to jump to the right location saves a lot of time instead of repeatedly navigating thru scenes. And speaking of running around, too bad Alice couldn't hang on to her scissors and a few other items instead of having to find new ones over and over. However, I gave this game four stars in spite of the aforementioned complaints because I still thoroughly enjoyed the experience. I have a feeling this is just the beginning of a well-crafted and immersive series. I'm looking forward to playing Missing Memories and then The Dark Side. I may even buy the CE for The Dark Side because of all the positive reviews. Rated 4 out of 5 by ninja226 from Heavy on puzzles, few HOS This is a nice adventure game with excellent voiceovers, animation and beautiful, crystal clear artwork. It's heavy on puzzles, and light on HOS. There are no junk piles in which to find objects. Instead, the HOS are comprised of a scene, silhouettes of items to find in the scene, with each item found being used with a particular item in scene, which gets you another object in the silhouette, and so on, until all items are found. The puzzles are those seen elsewhere, but modified for the theme of the game. Most puzzles are reasonable, but there are a few challenging ones. One thing I did not like, is there are NO reset buttons for the puzzles. One puzzle in particular I knew how to solve, but could not move one particular disk to solve, and ultimately had to skip. You get hint & skip even in hardest mode, which is nice. Had to use the Hint many times because there is no map indicator on hard mode, but helpful messages remain. The story is good. Loved the artwork, except the characters do not look natural and very artificial, as in robotic like humanoids. The only cute character was the green elf Anabel, but her appearance is too brief. The game covers a lot of territory in a world with many other worlds to explore. The ending is a bit anticlimactic, but ends satisfactorily. Rated 4 out of 5 by jbird26 from An enjoyable game This was an enjoyable game and I hope they make more. 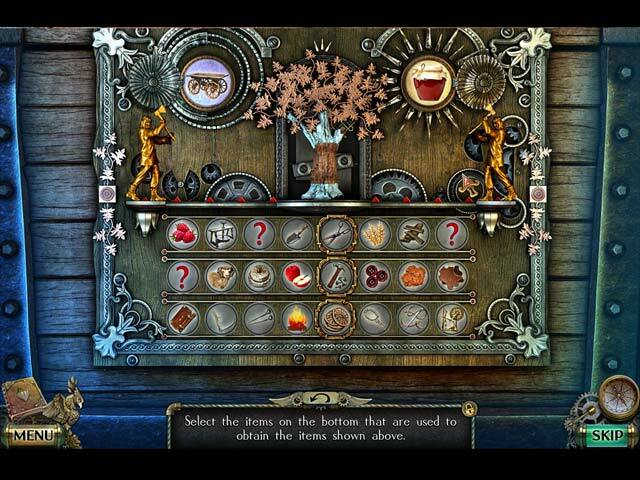 The hidden object scenes have a purpose as you use each item to help you find another item in the list. I liked the story line, the graphics. The puzzles aren't difficult but it didn't detract from the game! A soild game. Rated 3 out of 5 by roaming from Based on Demo Only There is no custom option, however you do have the ability to set the hint to 15 seconds and the skip to 30 seconds, which is IMO waaay too long given that many recent games have much shorter refill times. I don't like puzzles and want to skip them all. In this game, there are many puzzles and few HOS. The HOS seem all to be the progressive type. There are also some science and engineering projects that require gathering the necessary ingredients and parts to complete. There's nothing new here that hasn't been done already in similar games with fantasy storylines. And once again, the girl does all the work while her uncle stands around making demands and giving directions. Wear your hiking shoes; you'll need them. Thankfully, there is an interactive map, and some of the hints are transporting. Newbies to the pond might quite like this game, but elder fishies will have done it all before. Rated 3 out of 5 by brb1199119 from Too short! Absolutely loved this game except it was too short! The puzzles were fun but some were a little too easy. It kept me interested. The end was abrupt. Rated 1 out of 5 by Cherubabies from BORING ... I was waiting for this Game to get interesting and exciting but it NEVER did! There are lots of uninteresting things to do, running back and forth and making ridiculous things ... BORING! I am sorry I bought this Game. What a waste of money! Going to uninstall it now and hopefully I will never see it again!